A professional-grade hickory splitting axe for heavy-duty chopping work. Firewood cutters can put a lot of wear and tear on their axes. The STIHL Pro Splitting Axe is up to the challenge. It features a premium American hickory wood handle for reduced vibration and a long steel sleeve to help protect the handle in the event of an overstrike. Its unique 5-piece head attachment system is up to 2.5 times stronger than a traditional axe head connection. The head is forged from premium C60 steel and shaped to feature an extra-large striking face for improved splitting performance. 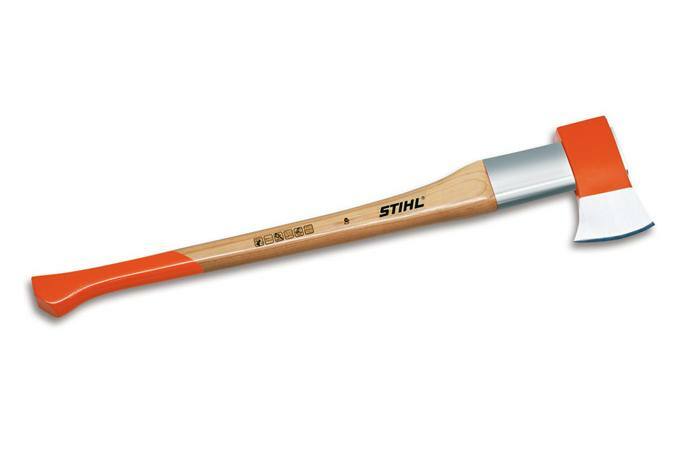 Weighing in at 5.5 lbs., this wood splitting axe is also well-balanced for swinging. Lighter than a splitting maul, it’s a dependable wood axe made for working all day – no two ways about it. Weight Of Cutting Head: 5.5 lb.